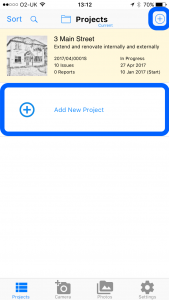 The free version of Site Report Pro allows up to 3 projects and 3 issues per project. 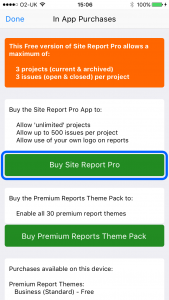 To allow up to ‘unlimited’ projects, 500 issues per project, and the use of your own logo, Site Report Pro can be purchased via an In-App Purchase. 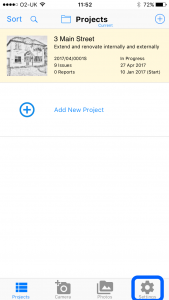 When trying to add your 4th project or 4th item in a project, the Site Report Pro In App Purchases screen will be displayed. 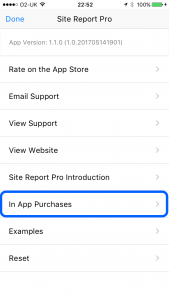 Click the Purchase Site Report Pro to make your purchase in the App Store. When the purchase has been completed, additional projects and issues per project can be added. Click Settings in the tab at the bottom. Click Buy Site Report Pro. Purchase the Premium Theme Pack which enables all 30 premium themes. Restore all Site Report Pro purchases on this device that have been made using another device. 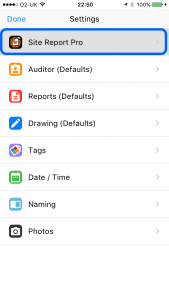 View all Site Report Pro In App purchases that have been and available on this device. To learn more about the Premium Themes, view the Premium Themes article. To learn more about restoring purchases on this device, view the Restore Purchases article.